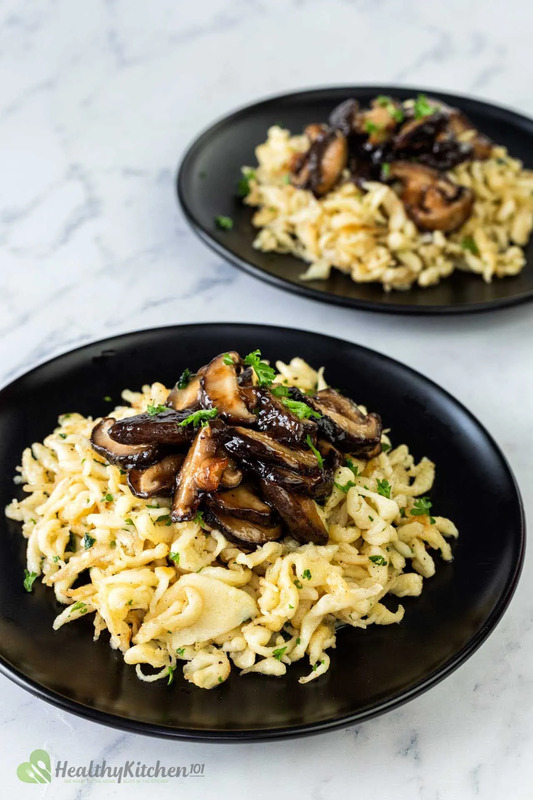 I never knew making pasta could be this simple and fast, until I got my hands on this spaetzle recipe. Here’s a little backstory behind this recipe: It was not until 6 years ago that I actually tasted real German cuisine, and I mean real German food, not just some knock-off smoked sausages. I was lucky enough to have a friend whose mother was German, and they were so generous that they invited me over for dinner since I told them I had never had German food. When I got to their home, I was just in time to witness the culinary wonder of the making of spaetzle. Spätzle /ˈʃpɛtslə/, or Spaetzle, is a type of pasta that is made primarily from salt, eggs, and a type of strong flour. In order to make spaetzle, all you need to do is simply mix all of the ingredients together until a smooth batter is formed. The batter is spread onto a wooden cutting board, and then scrapped off the board, in the form of long thin strips, into salted boiling water. When the shaped dough hits the water, it will become firm and start to cook. Once cooked, the egg pasta will float to the surface, ready to be fished out of the water. That is how to make spaetzle manually, which was the technique that my friend’s mom used, and you have to see it at least once. It’s one of the beauties of making food from scratch. If you want to check it out, search for spaetzle recipes on Youtube and just pick any from the homemade videos. Can You Use A Ricer To Make Spaetzle? If you don’t have a special cutting board, that is made specifically for the purpose of making spaetzle, you can use a ricer instead. Simply put the batter into the ricer and press down. You can use whatever tool you have on hand to make the spaetzle as well. I usually use my grater, but I reckon a slotted spoon or a strainer with lots of small holes will work just fine. Be creative, anything you have on hand, as long as it has lots of small round holes to shape the spaetzle, will work. Now, spaetzle comes in many different shapes and sizes, from long and thin strips, to little droplets, to undefined shapes. But no matter what shape it takes it will always be delicious. You can eat it as is or with some sort of meat stew. You can add an extra touch to it by pan frying it in some butter with any kind of herb you prefer like thyme, rosemary or sage. The buttery spaetzle is crispy on the outside yet soft on the inside; and the herbs give the dish an extra depth of flavor. Though the dish originated in the South of Germany, it has now become popular in many other regions of the world. Spaetzle sold in stores usually comes in the shape of dried long and thin strips. I remember seeing it in a supermarket once, but didn’t pay much attention to it as I hardly buy premade food. You can try checking out the German food market, too, if it’s available in your area. Can’t find it? Well then I guess you’ll have to stop looking and start making it yourself. Can Spaetzle Be Made Ahead? Yes, you can make spaetzle ahead of time. Even though it only takes minutes to make, I like to have some ready to eat throughout the week every once in a while. When you have some time to spare, make a big batch of this eggy pasta. Boil and drain it as usual; and toss it in olive oil to prevent sticking. Wrap it with cling film or put it in an airtight container so that it won’t dry out. To reheat your spaetzle, stir-fry it over medium-high heat so that it crisps up on the outside instead of putting it in the microwave. But you need to know how to make spaetzle first! Let’s get cooking. This might not be your authentic spaetzle recipe like the one your granny used to make, but I’m telling you it’s worth a try. Why wouldn’t it be anyway, when it’s so easy to make? In around 15-20 minutes, you will have some stunning, homemade German pasta for dinner. Combine all of the ingredients in a clean bowl and whisk until smooth. Check to see if you have reached the right consistency: we’re aiming for a rather thick batter, so if your batter is too runny, add more flour. Add 1 tablespoon of flour at a time and whisk until smooth. How to know your batter has the right texture: use a spatula to lift the batter up in the air. As the batter drips slowly back into the bowl, if it holds its shape, you’re good to move on to the next step. Bring a pot of salted water to a boil. Once the water is boiling, back the heat down to simmer. Using a grater, scoop a spoonful of the batter onto the back of the grater (smooth side facing up), and press it down with a spatula over the pot of water. The batter will go through the holes of the grater and form its shape once it’s in the boiling water. Remove the spaetzle with a strainer immediately when it floats to the surface. Put the spaetzle in a clean bowl and drizzle some olive oil over to prevent them from drying out. To serve: melt some butter in a pan and fry the spaetzle until crispy on the outside. Check for salt, and season with freshly cracked black pepper or a kind of fresh herb if desired. The spaetzle tastes delicious as is or with any type of meat. Another tip to tell if your spaetzle batter has reached the right consistency is to spread it on the back of the grater, it shouldn’t drip through the holes of the grater without you pressing it.